The badminton program allows participants to make challenges against opponents and submit their game scores. The badminton challenge ladder software updates ranking positions after each result is reported. View other badminton software products that R2 Sports has to offer including: Membership, leagues, tournament management, and rankings software. Use a computer or smart phone with internet access and do everything needed for the badminton ladder on the ladder website. The home page shows recent activities and results. It also has links for a new player wanting to register for a ladder, making and reporting challenges, viewing rules, and seeing the badminton ladder rankings. Participants can register online for the badminton ladder. During registration the enter profile and contact data, then select the divisions in which to compete. After the online entry has been completed, the player will be given a challenge ranking spot at the bottom of the badminton ladder. Participants can view all the specific details and rules of the challenge ladder on the challenge ladder rules page. This page will list how many ranking positions that can be challenged higher, the format of the game play, and any additional instructions from the badminton ladder director. On the badminton ladder website, participants can login through the reporting section and view available challenges, challenge opponents, and submit match results. The badminton program sends out automated emails when a challenge match is requested. Other automated emails are sent when a forfeit due to no response occurs, someone cancels a match, results are reported, and when a penalties are given. After results are recorded, the badminton ladder rankings are updated and a new challenge can then me made. Enter a badminton ladder today. The director goes through the sports ladder software setup which creates the ladder website for the players. Select from choices like: If females can play in the male divisions, how many rankings spots can be challenged higher, the amount of time a participant has to respond to a challenge before receiving a forfeit, if a non-participation penalty is issued after not making any challenges within a certain time period, and more. 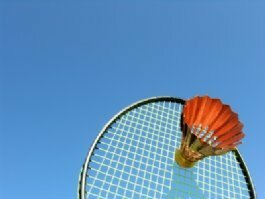 Select which divisions are available for the badminton players to join. Choose to have multiple ladders to separate skill levels or age groups. Another setup option allows for matches on a ladder to count on other ladders or use matches from the R2sports tournament software. In the participants section, the director has the ability to enter participants manually, make and accept challenges for a player, and report match scores. If someone reports incorrect results, use the ladder software to update the division rankings. Once the director sets up the ladder, there is not much else for the director to do unless a dispute comes up between the players. Activate free badminton challenge ladder. View previous Badminton tournament and league results.